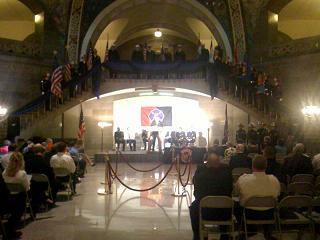 A solemn day at the Capitol as state fire officials honor those who lost their lives in the line of duty in 2009. The sound of a ringing bell resonates in the Capitol Rotunda. It’s rung nine times, three for each of the three firefighters who died while serving across the state last year; signaling their last call. Mick Schwent is the Fire Chief in Ste. Genevieve, where 34-year-old rookie David Grass died in training last July. “He was one of those guys we look for that we can ask for that dedication and commitment to his community. He couldn’t wait to get started,” Schwent said. Grass would have been a volunteer, like a man on the other end of the spectrum; 70-year-old Schell City Asst. Fire Chief Dale Haddix. 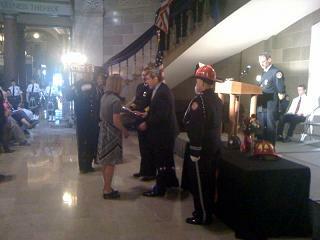 Haddix served as a fire fighter for 30 years before dying at the scene of a house fire last July. 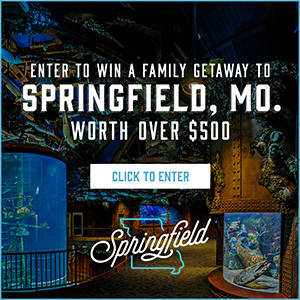 “It’s emotional for everybody and it’s very tough to sit through these it just brings back a lot of memories,” said Tony Kelly, President of the Missouri State Council of Firefighters. The final man honored was 49-year-old Roger Vorwark. He died last March after 28 years of service. “The Thursday before his death on a Saturday he had just been promoted to Lieutenant. That was always one of his goals, to become an officer in our department,” said Kevin Campbell, Vorwark’s Chief in Odessa. Vorwark was also a volunteer for most of his time as a firefighter. He just went to full-time within the last year, working in Odessa for five years after transferring from a smaller department. 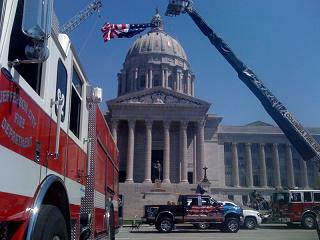 According to the Department of Public Safety, 75% of the 20,000 firefighters in the state of Missouri are volunteers. Family members were on hand for the ceremony. Kelley says there will be others around the state later this year.